November 14, 1930: “The Gumm Sisters” performed at the Lancaster Grammar School’s play, “The Old Sleuth.” They sang “My Baby Comes For Me” between the acts of the play. November 14, 1934: The first night of a six-night engagement for “The Garland Sisters” at the Orpheum Theater in Los Angeles, California. This was a return engagement for the sisters and from this point forward they would use the Garland name for all of their engagement. The films on the bill were Desirable and The Lemon Drop Kid. November 14, 1939: Judy’s weekly appearance on “The Pepsodent Show Starring Bob Hope” on NBC Radio. 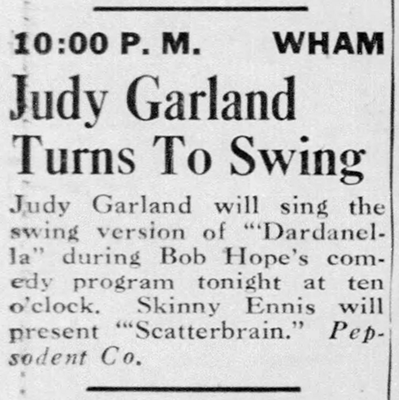 Judy sang “Dardenella.” This was previously thought to have been on November 13th but all of Hope’s shows were on Tuesdays, not Mondays. 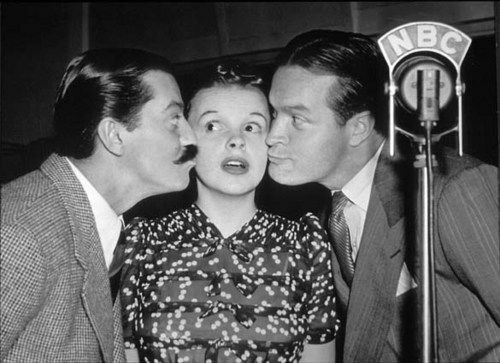 Photo: Judy with Jerry Colonna and Bob Hope during a broadcast. Colonna was also a series regular. 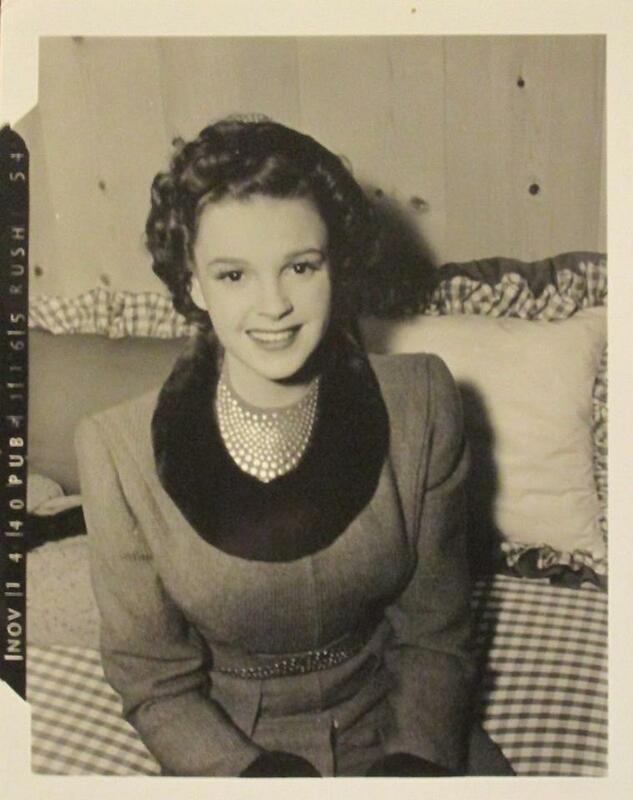 November 14, 1940: This pic was taken of Judy in her dressing room on the set of Ziegfeld Girl. 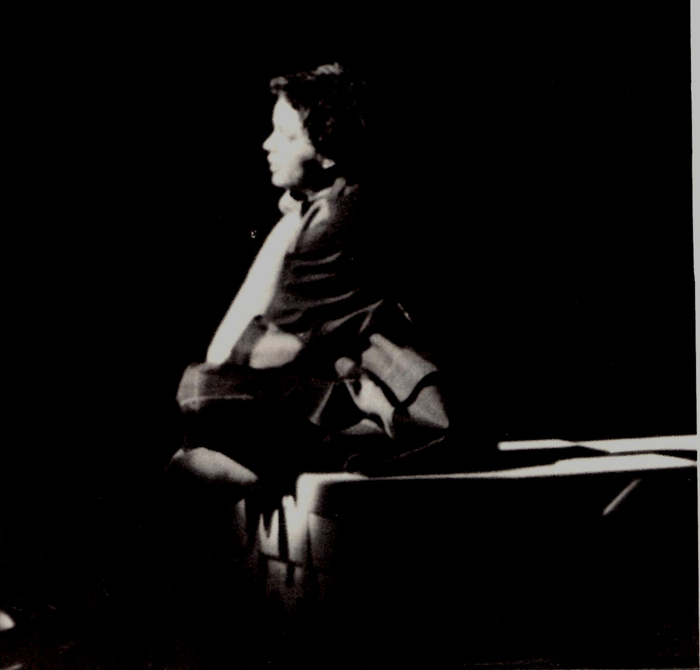 At this point, Judy was in rehearsals for the film and had just pre-recorded the comedic and ballad versions of “I’m Always Chasing Rainbows” the day before. 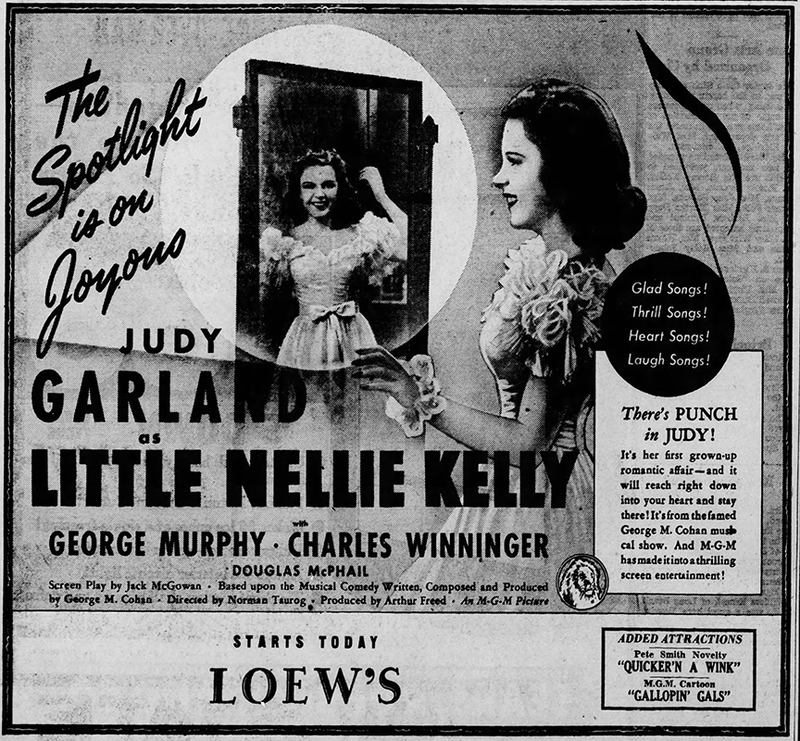 Little Nellie Kelly was in theaters and although it wasn’t the greatest film ever made, Judy received glowing reviews. November 14, 1942: The article on the left reported that Judy allegedly helped an MGM office boy prank his prankster co-workers. It’s a nice story and in keeping with Judy’s helpful and friendly personality but it’s highly doubtful that Judy ever ventured to the top of a studio building to sunbathe, certainly not at this point in her career. She didn’t have the time. 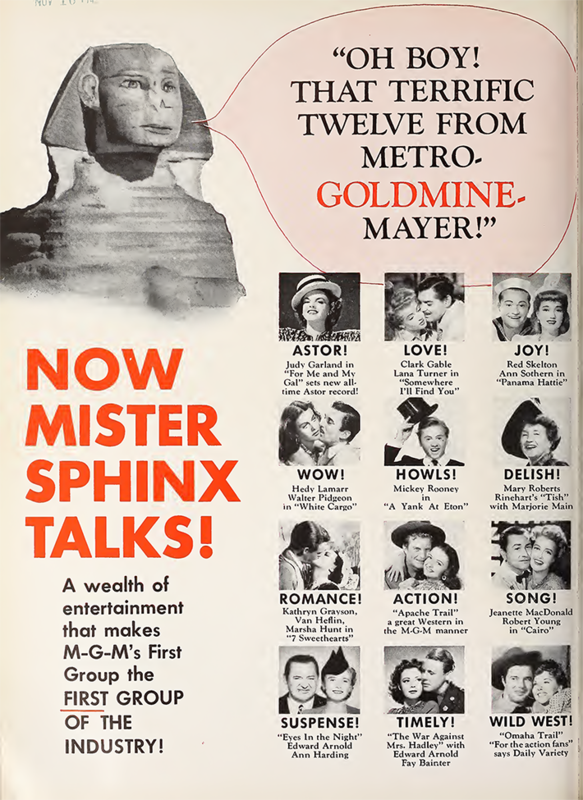 The ad above right was published in the “Film Daily” trade magazine. 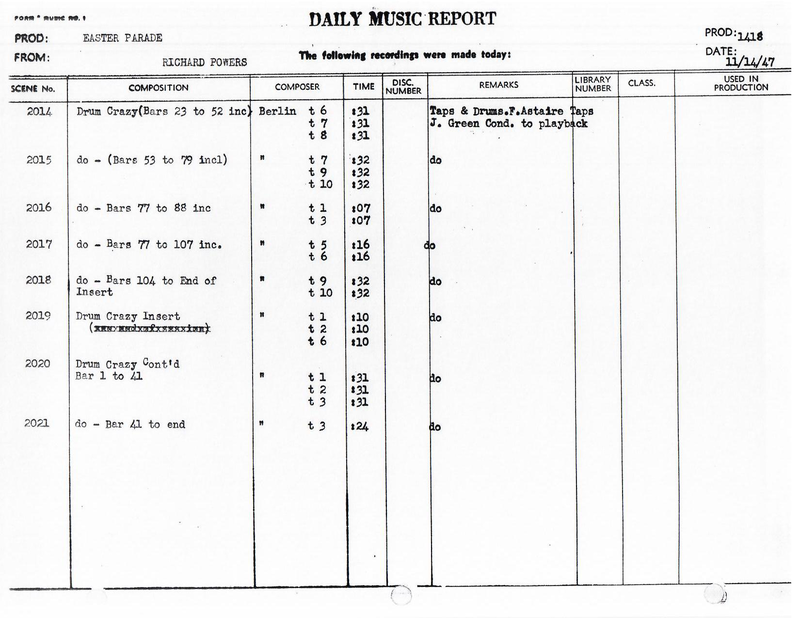 November 14, 1947: Judy had rehearsals of the numbers “Mr. Monotony” and “I Wish I Were In Michigan” for Easter Parade. She had prerecorded the songs on November 12th. 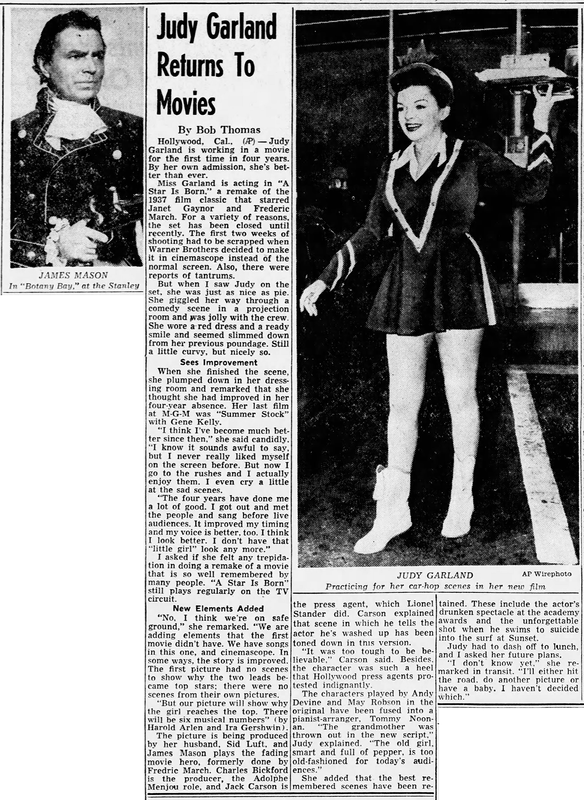 Time called: 12:00 p.m.; dismissed: 5:00 p.m. Judy’s co-star, Fred Astaire, was at the MGM Recording Studio pre-recording “Taps & Drums” as seen in the Daily Music Report below. Among other things, Astaire was a drum enthusiast. November 14, 1951: Inez Robb reported on Judy’s recent collapse and spoke to her about her struggles with self-confidence. Judy was candid about it and also about her audiences and they took her into their hearts. 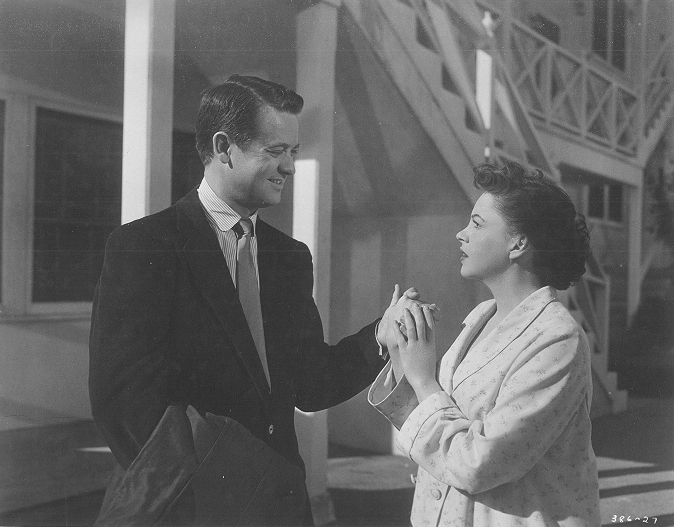 November 14, 1953: A Star Is Born filming continued with scenes shot on the “Exterior Oleander Arms” set which was filmed on location with an apartment building standing is as the Oleander Arms. Time started: 10 a.m.; finished: 5:45 p.m.
By chance (or perhaps intentional) the newspaper, “The Evening Sun” out of Baltimore, Maryland, featured an unrelated image of Judy’s co-star James Mason in his latest film, Botany Bay. November 14, 1954: What makes a great holiday gift? Judy’s recent album of songs from the soundtrack of A Star Is Born of course! 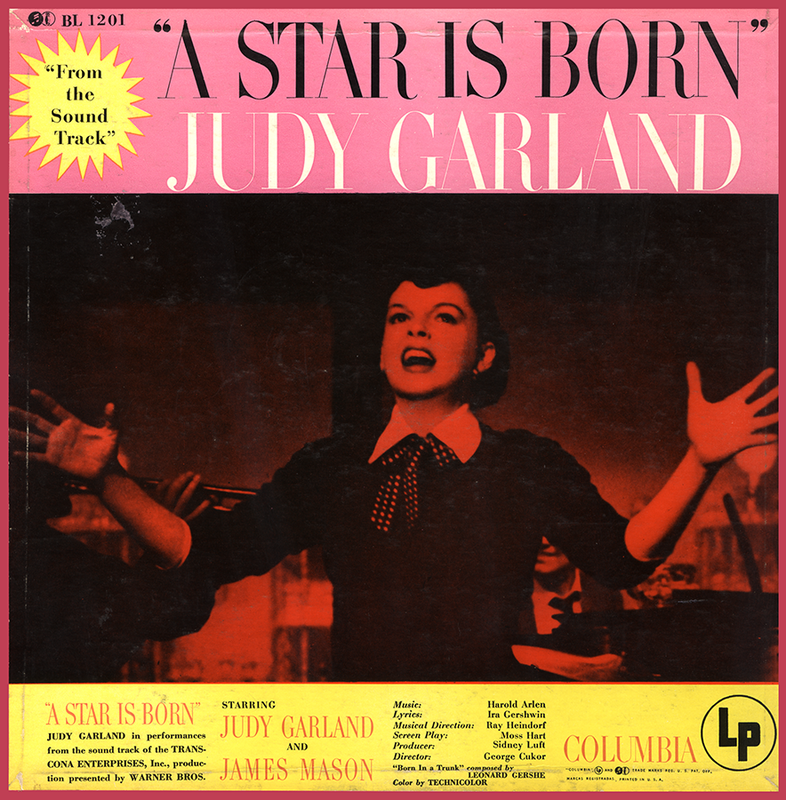 Check out The Judy Garland Online Discography’s A Star Is Born pages for details about all of the versions of the soundtrack. November 14, 1957: The Clock was featured on “The Late Show” in New York City. November 14, 1957: Being “The World’s Greatest Entertainer” has its perks, such as meeting all of the crowned heads of Europe. 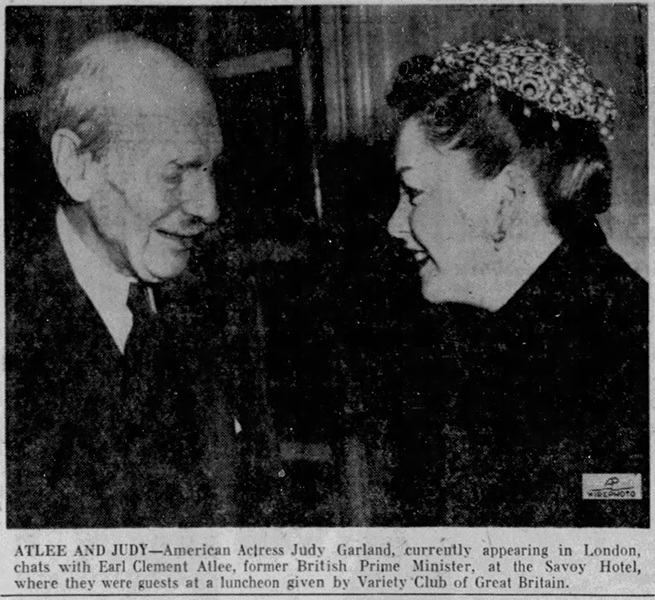 Judy was currently in concert at The Dominion Theater in London, England, when she attended a luncheon in her honor given by The Variety Club of Great Britain at the Savoy. 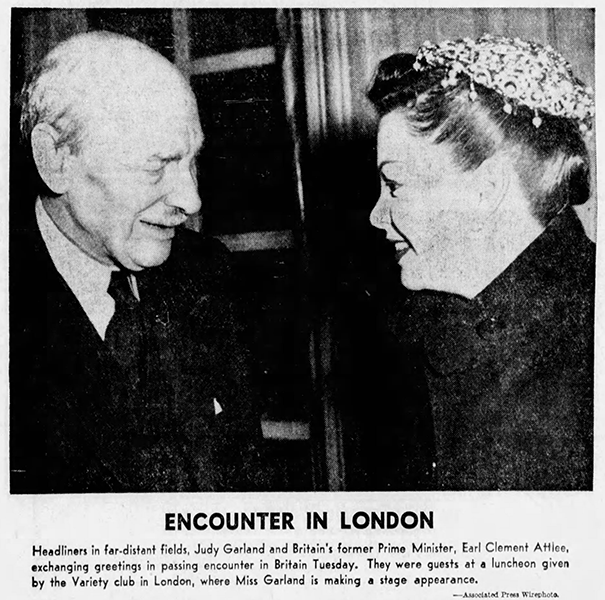 She attended with comedian Alan King (her opening act) and met former UK Prime Minister Earl Clement Atlee. Being that this photo was published on this date, the event most likely took place the day before. 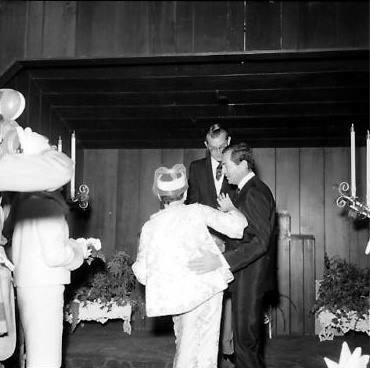 November 14, 1965: Judy married actor Mark Herron, her fourth husband, in Las Vegas, Nevada, at 1:30 a.m. at the Little Church of the West, by Dr. David Howe of the Church of Religious Science. Her publicist, Guy McElwaine, was best man and his wife, actress Pamela Austin, matron of honor. “The Los Angeles Herald-Examiner” stated that after the ceremony the party, including Eddie Fisher, moved on to catch Don Rickles’ show. Rickles gave the newlyweds a terrific ribbing. The party went on until 7 a.m. 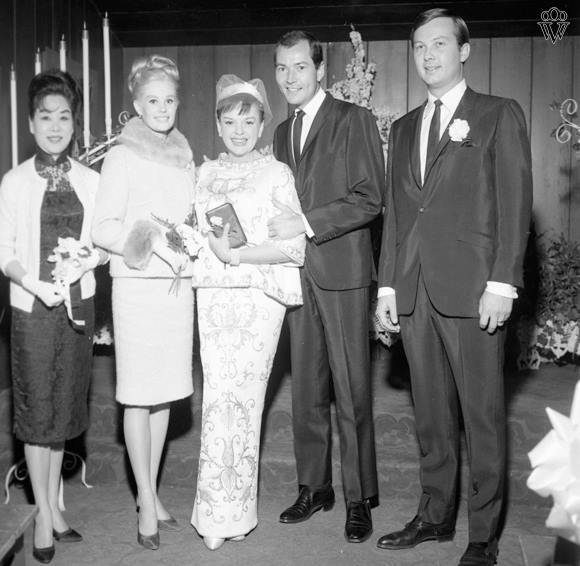 Apparently, the decision to fly to Vegas was so sudden that jeweler Marvin Hime had to go to Judy’s home at 3 p.m. Saturday, November 13, to fit them for their wedding rings. Judy and Mark honeymooned for a week in San Francisco and Carmel, California. 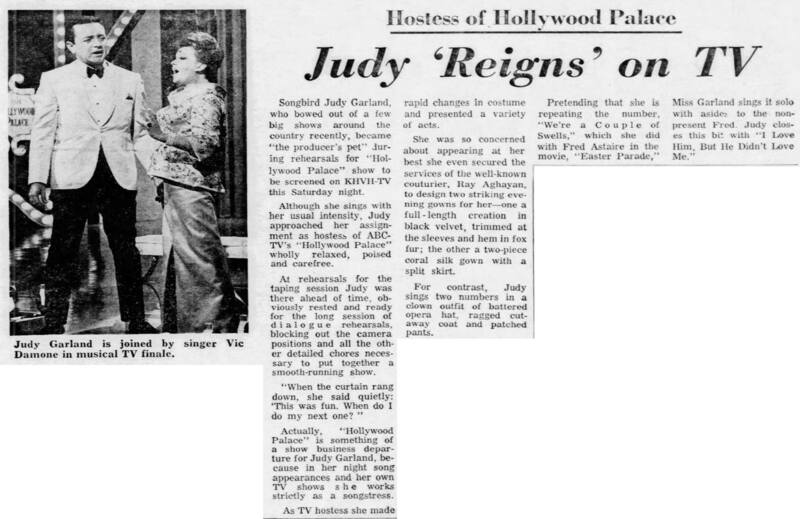 November 14, 1965: Judy’s appearance as guest hostess on “The Hollywood Palace” the day before (the 13th) garnered Judy some great reviews. November 14, 1967: Judy was a Tony Bennett fan. 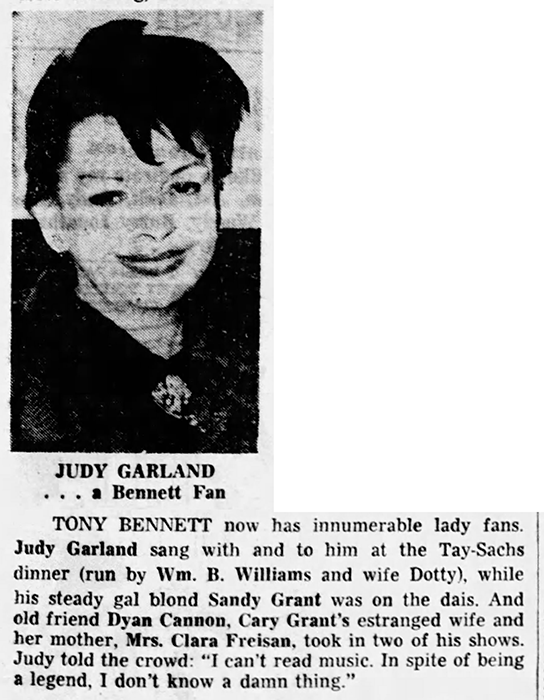 Columnist Earl Wilson mentioned Judy’s recent attendance at the Tay-Sachs dinner honoring Bennett. 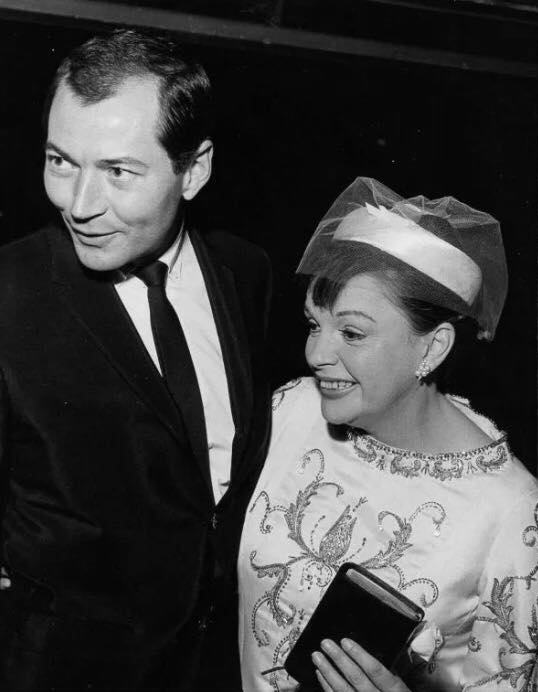 To this day, Bennett has been a huge fan and admirer of Judy’s and never hesitates to remark about how she was the greatest talent he’s ever known. Little Nellie Kelly: You wrote that “it may not be the greatest film ever made…” I feel it’s the absolute worst of all of Judy’s post-Oz MGM films. There is no story, just Charles Winniger never accepting George Murphy. A real dud, in my opinion, and one I don’t own. The numbers aren’t even much, with only “Singin’ in the Rain” standing out amongst the rubble. Judy’s Herron Marriage: Super bizarre, and, yes, Rickles must’ve had a field day with that material at hand! 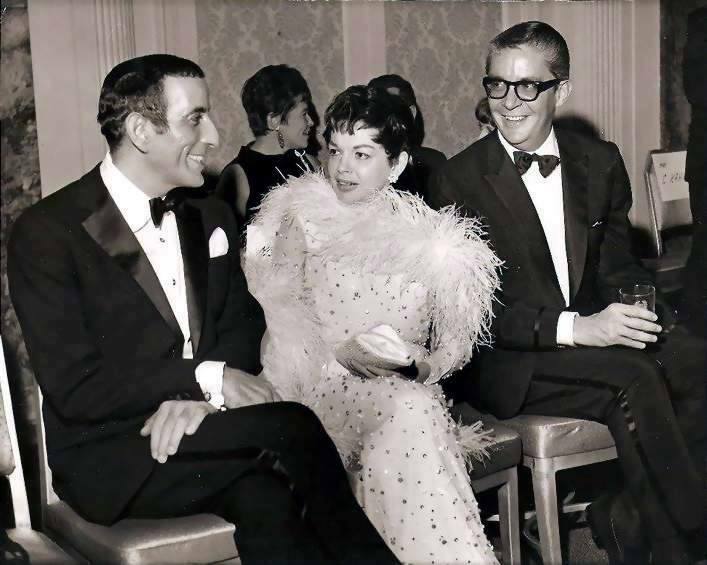 The Hollywood Palace reviews: I’m glad Judy got such glowing reviews, as she richly deserved them. Besides “Once in a Lifetime”, her take on Cole Porter’s “I Loved Him” is very touching in its simplicity. 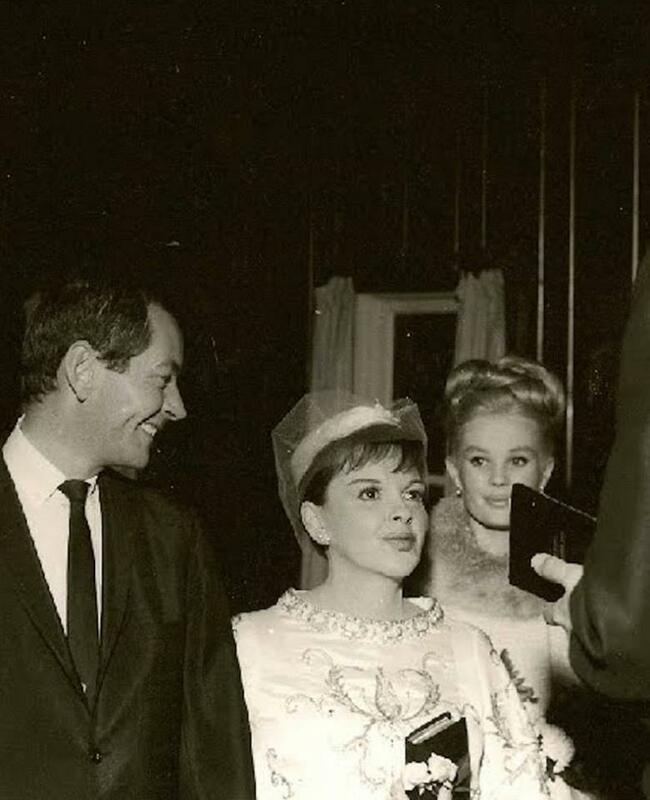 I always thought Judy looked so lovely in so many pics of her in 1965. She wasn’t sickly thin, nor heavy, and her makeup and hair always seemed to become her. Thanks for the reviews and pictures! You’re welcome! I have always loved “I Loved Him.” Judy’s take on that is so wonderful and such a little known gem of hers. I wish someone would have done an in-depth interview with Herron. He’s a bit of an enigma to me. He comes out of left field in Judy’s life and actually ends up marrying her. It’s bizarre.